During the middle ages, St John’s Wood really was a wood, which took its name from the Knights Hospitaller of St John of Jerusalem who owned the land. There was a small settlement on the bourne, or river, that flowed to the south, with a church dedicated to St Mary from about 1400. 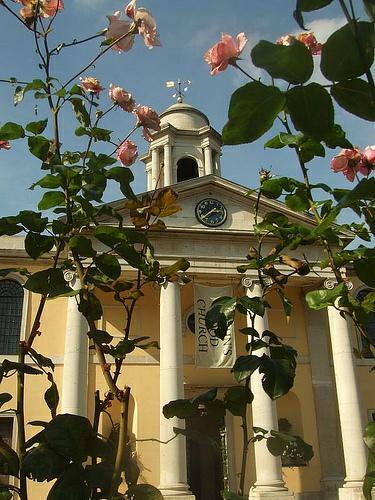 This became known as St Mary on the Bourne – later shortened to St Marylebone. London itself began to expand northwards from Westminster in the 17th century as far as the new road – now known as Marylebone Road. The area that now forms Regent’s Park was farmland until the Prince Regent employed his architect, John Nash, to build the grand terraces that still dominate the Park. A proposal to build a royal palace in the middle of the park was abandoned in favour of building the present Buckingham Palace at the beginning of the 19th century. 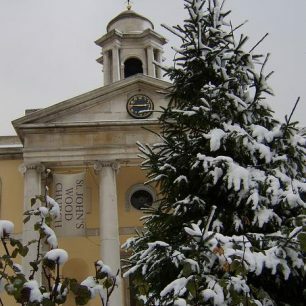 Westminster City Council first bought the plot of land, which now forms the burial ground behind St John’s Wood Church in 1808. 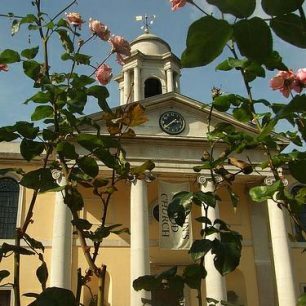 The church itself was built to accommodate the growing population of the neighbourhood by the Vestry of St Marylebone Church in 1814. 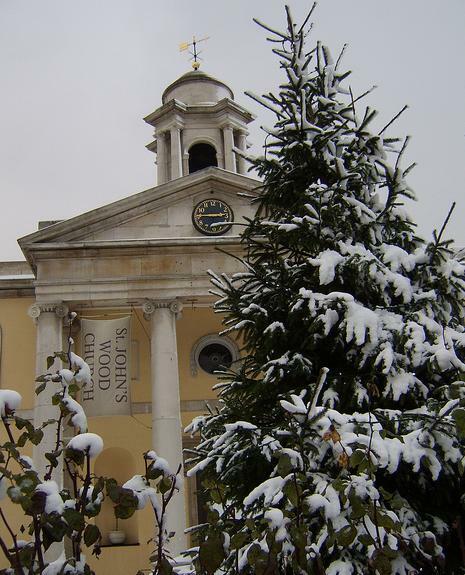 The architect was Thomas Hardwick who also built the new church at St Marylebone shortly afterwards. Thomas Lord moved his cricket ground to St John’s Wood at the same time, and he offered his new Pavilion for the celebrations connected with the consecration of the completed church on Tuesday 24th May 1814. In 1886 the burial ground was closed and in 1889 St John’s Wood Chapel became part of the parish of Christchurch Cosway Street. 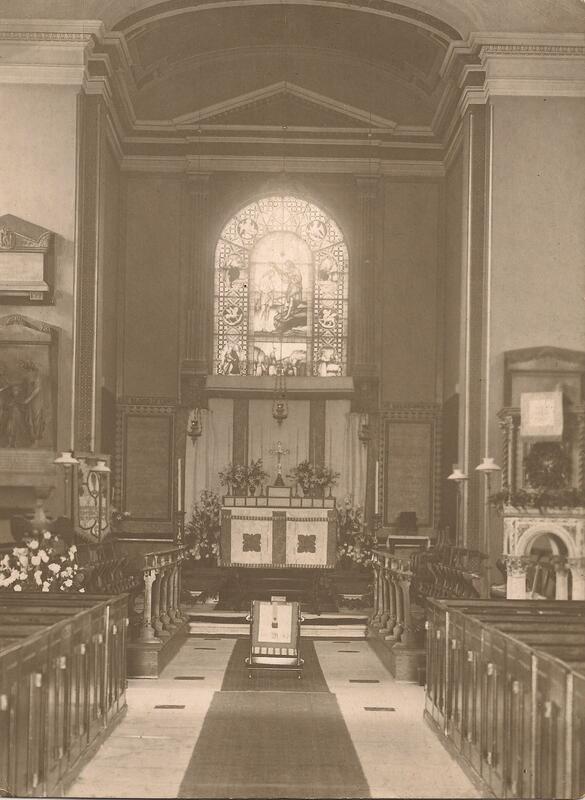 In 1952 the Chapel became a parish church replacing St Stephen’s, Avenue Road, which had been damaged in the war. The church is a simple building in Regency style with a portico of four Ionic columns. The interior is very plainly decorated in white and gold which makes it reminiscent of churches in New England. The box pews are original. 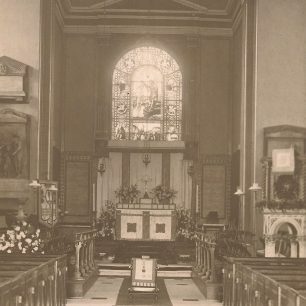 The chancel was extended in the middle of the nineteenth century when it was dominated by a stained glass widow of St John the Baptist. Together with our Victorian stained glass in the nave, this was destroyed in the Second World War and was not replaced. Some restoration of the building took place in 1938 and the galleries were enclosed at this time to provide meeting rooms. During a further restoration in 1991 a new chancel pavement was laid in limestone and the present central altar replaced the old high altar at the east end of the church. The organ may have originally been placed in the West Gallery of the church but has occupied its present position since the beginning of the twentieth century. It was completely rebuilt in 1957 and the electronic action replaced in 1989. The church contains an interesting collection of early nineteenth century funerary monuments, a number of which record associations with the East India Company. The monument on the south side of the chancel by Chantry is particularly fine. The statue of St John, the Baptist in the forecourt of the church is by Hans Feibusch and was erected to mark the completion of the building of the new hall in 1977. A History of the Church by John Oliver and Peter Bradshaw was published in 1955. Also see the Places of Worship category on this site. This page was added on 30/11/2011.